At Thomas Appliance Service we want to make scheduling your appliance repair appointment as convenient as possible. As always, you can call us at (408) 243-3128 or (408) 842-4639, You can also fax your request to (408) 226-4413 or (408) 847-6460. You can depend on us for all of your major appliance repairs. 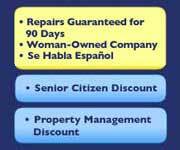 We have been in business since 1976, and are fully licensed and insured. We also accept Visa and MasterCard.